• On the hustings: Member for McMillan Russell Broadbent, PCAC care manager Carina Ross, PCAC business manager Emmah Welsh and PCAC CEO Justin Wightman. FOSTER’S Prom Country Aged Care will receive four additional aged care places under the 2018/19 Aged Care Approvals Round. Member for McMillan, Russell Broadbent welcomed the additional places for Prom Country, saying it was important people have the opportunity to be cared for locally as they age. The veteran politician made the announcement at PCAC on Monday, arriving with a small Russell Broadbent MP billboard for the sake of the photograph. “We know how important it is to help people to continue to live in the local areas they know and love, surrounded by their family, friends and support networks,” he said. 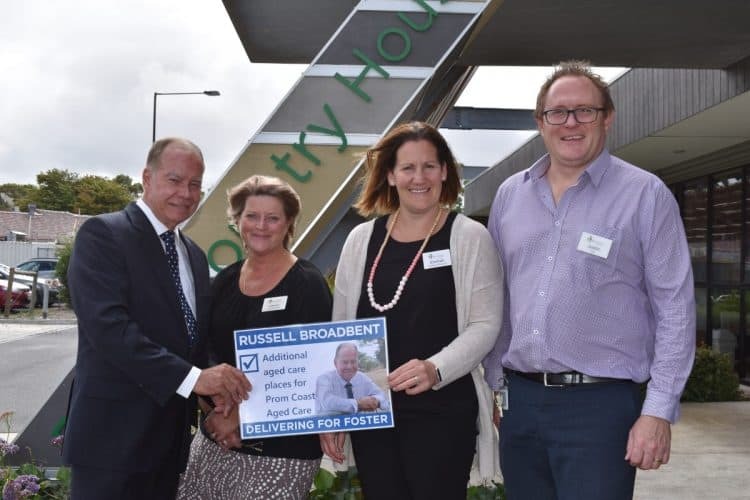 “Prom Country Aged Care do a fantastic job in caring for our community and I am pleased that through this round of ACAR funding that more locals will be able to have access to care in Foster. “Our aged care providers, like Prom Country, give wonderful, amazing care and they give that care locally so people don’t have to move away from the area and their families for aged care. I would like to thank Prom Country Aged Care for their ongoing commitment to caring for our Prom Coast communities”.